Tiny Tina's Assault on Dragon Keep is the latest piece of DLC for Borderlands 2. Taking a break from fighting Hyperion, Lilith, Brick and Mordecai are playing a Dungeons and Dragons-style RPG called "Bunkers and Badasses" with Tina as the dungeon master, with your Vault Hunters being the player characters. 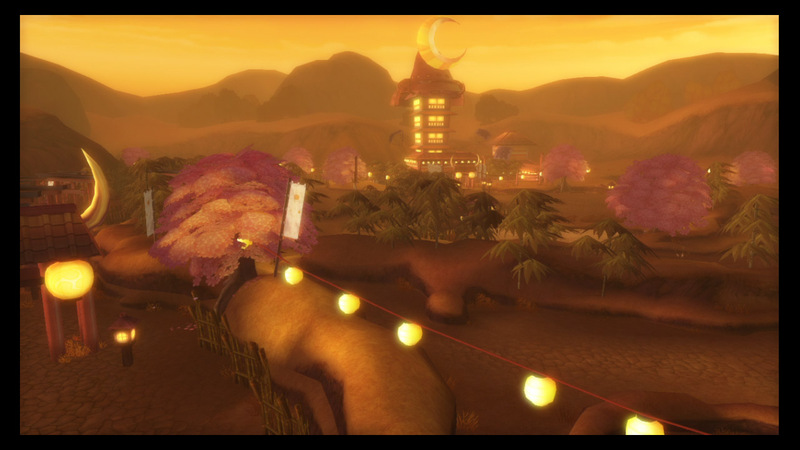 The game within the game takes place in a fantasy setting very different from the normal wastelands of Pandora. It all starts out as a bright and sunny place with butterflies and rainbows until Tina is reminded it was supposed to be bleak. Then it becomes a dark, spooky place, resembling the dark woods from several fairy tales. Throughout the DLC, you will be travelling from a shore, through the woods and to the tall tower of Dragon Keep. The settings are cool, and thankfully will change to their cheerier counterparts once you beat the main campaign. Each area is pretty big. You have plenty of room to explore and various places to go for the many quests contained within. To go along with the new setting, there are plenty of new enemies that fit the fantasy theme. There are skeletons, knights, orcs, golems and treants to name a few. Some behave similarly to enemies found in the base game, there are Suicide Skeletons and the golems are similar to the Goliaths. Even so, there are lots of new things, like sorcerers that summon things like fire birds, skeletons that have a sword that must be removed to kill them, and floating skeleton heads. For some reason, I really like the treants. Maybe it's just because I haven't played a game that lets me shoot them, but the little ones have some great animation. Not only do some of them have axes stuck in their heads, but when they die, they sink into the ground and grow a small patch of mushrooms. It's a cool little touch that I enjoy. The most annoying enemies are the Orcs warlords that level up similar to the Goliaths. They can quickly become five levels over you, making them ridiculously hard to kill and are best avoided at that point. The story of Assault on Dragon Keep is actually really good. Without giving away many spoilers, it primarily deals with Tina dealing with the events that take place near the end of the main game. It's funny and even sad at some points. Being a game within a game, it is very self aware. I like that it breaks the fourth wall without actually breaking it. It stays true to the world of Borderlands while still cramming in lots of references, winks and nods to fantasy and sci-fi. In a lot of ways it's a love letter to the "nerdier" side of life (yay! ), and I definitely approve. Plus, it even has my new favorite character, Mister Torgue. I'm glad they found a way to stick him in there because my wife and I loved listening to him talk in the Torgue DLC, and I'm happy to hear him yell again. Although the best lines, to me, are when Tina is voicing Roland. Hearing the strange way she talks but in Roland's voice is just funny. At this point you are likely wondering how long the DLC is. The main campaign itself is about 5 hours. A chunk of this will be spent on the boss fights, since they last a long time. There's three main ones, and each one took my wife and I about 20 minutes. We were both level 50 and playing on True Vault Hunter mode if you want a frame of reference. The boss fights were probably the least fun part of the whole campaign. They were fine fights but just took too long. Besides the main campaign, there are numerous side quests to do. Many of these poke fun at MMOs or are references to other game and the like. They are enjoyable, and there are at least 2-3 in each zone. Unlike the previous DLCs, which had three achievements each, Dragon Keep has ten. You get a few through normal progression and doing the missions, but a few require extra effort, like feeding the queen, attacking the darkness (snicker) and getting the amulet. The hardest would be defeating the Raid boss, which will likely require a full party, same as the other raid bosses. I enjoyed Assault on Dragon Keep. The main campaign and side quests are both more enjoyable than Campaign of Carnage, although I didn't find it quite as funny. However, it is very well written and humorous. There's plenty of references to sci-fi and fantasy properties while still remaining true to the Borderlands universe. It has enough hours of playtime to be worth the $10. If you enjoyed playing Borderlands, Assault on Dragon Keep should be on your list of DLCs to buy BECAUSE... REASONS! When I tried to play the new Marvel Heroes and Neverwinter games, it really hit me how much I needed to get a new computer. Being two or three years old means my average machine is now low tier. Yeah, one of the reason I don't like computer gaming...but that's not the subject here. Instead of getting a whole new one, I decided to just buy a new graphics card so I can hopefully not play slideshows. Since my rig is an Acer Aspire x3400, it offers little in the way of usable cards since it is a mini ATX. The power supply is really what limits what cards I can use. Rather than add that to the list of things to buy, I just got a cheap-ish card that won't overtax the system but still upgrade my graphical capabilities. I went with a AMD Radeon 5450, since my research showed it to be about the best I can fit in there without ponying up for another power supply. It arrived today, so I shut all my stuff down and installed the new card. Trouble is, I was following the directions, so I didn't have the drivers installed beforehand. Oops. So I had a black screen for a few hours. The unit still turned on, but I couldn't get a display. After looking online for some help (I used my old computer downstairs), it seems as though the BIOS disabled the old onboard card for the new one, but couldn't use it since it didn't have drivers. Unfortunately, removing the new card didn't set it back. Eventually, I had to take out the DVD drive and HD to get to the motherboard's battery. I removed that, which reset the BIOS and I was able to boot up again. This time I installed the drivers and put it back in. It did work after about 30 seconds of nothing. Then, of course, the drivers I downloaded didn't really work right. The display was horrible and I could barely change the resolution. So I used the included CD, which would have older drivers, and... it worked. Long story short, there is a new review coming very soon, it just got pushed back from dealing with this nonsense. Oh, and in case you are wondering, Marvel Heroes and Neverwinter do run better. Not great, but it is an upgrade. Atelier Totori Plus is a PS Vita port of a PS3 JRPG, but adds in the DLC characters and a new end-game dungeon. Players will guide Totori on her quest to become a great adventurer, perfect her alchemy and possibly learn the fate of her lost adventurer mother. This game is a sequel to Atelier Rorona, as Totori has become Rorona's student after the events of that game. First off, I am really impressed with the graphics in Totori. They just look great on the Vita. The dialogue pictures are of course really well done and detailed, but the battle graphics are just as good. The game appears to be 3D cell-shaded, and looks wonderful. The character models and locations are really well done and a joy to look at. The game has dual language Japanese and English. Quite a bit of the game is spoken dialogue, and the voices sound good. The music is nice and fitting, and people who played Rorona will find some familiar tracks while playing the game. Sound effects in the game are also pretty good, my favorite being the noise when you defeat an enemy. I don't know why I like it, but it reminds me of air being let out of a balloon, so I almost picture the enemies deflating when they are killed. After a small introductory portion, Totori makes her way to Arland to apply for an adventurer's license. She receives it, but will have it revoked after 3 years if she doesn't perform adequately as an adventurer. This is how the game imposes the famous Atelier 3 year limit on you. However, there are intermittent goals every 3 months or so, or anything else like that. Just "you have 3 years, go do stuff". I really like this, as it makes it more laid back in terms of progression. Performing certain tasks, like finding all the gathering points on certain maps, killing x amount of y enemies, and fulfilling x number of requests will give you points on your license. When you have enough, traveling back to the adventurer's guild can get it upgraded to the next level. It's fairly open-ended and I had fun doing what I could to upgrade my license, and it wasn't too hard in the early going. Be warned that if you do not rank up enough by the end of the 3 years, it's still game over. However, if you can attain Diamond rank (right after Platinum) before the 3 years are up, something awesome happens. You get a license extension! This allows greater freedom in an Atelier game, since they are pretty strict with the time limit. Honestly, this feature is my favorite part of the game. As much as I like playing them, the time limit is always at the back of my mind, so being able to double that limit is very exciting! Time can be quickly lost in Atelier Totori. Moving to different areas quickly eats up the time you have, as even moving between the main towns takes almost two weeks until about halfway through the game (make sure to save a Bounce Stone). Each gathering spot in a given map takes about half a day, so stocking up by grabbing everything there might not be the best option. I'm an item hoarder, so it's hard to not just grab all of the items so I can maximize my time. Battles also take time that makes the deadline come faster and faster. Items do exists that cut down on all the time spent doing things like travelling and gathering (these are also in Atelier Ayesha, if you have played that before). It takes longer than I'd like to get them, but they really help, so get them as soon as you can. The combat is fairly standard, turn-based JRPG faire. When your turn comes up, you can attack, use a skill (or item if you are an alchemist), defend or run away (cue the Monty Python voice). Like Atelier Rorona, the two other party members can fill a meter that allows them to either follow up one of Totori's attack or defend her from an enemy's attack. Totori must use an item to have the option of another party member follow it up. In the previous game, Rorona, party members could follow up the basic attack, and I wish Totori had followed suit. Using your other party members to shield you is really useful, since Totori herself is somewhat fragile. The skills that characters get can be very powerful, but take enough MP that you can't just throw them out willy-nilly. Unfortunately in the beginning, only one of my characters had a usable battle skill. The other party member, Gino, only got one after giving him an item, which took too long to get. The first character that could replace him was too low a level to be of any use. Given the limited time in the game, I didn't want to spend the time grinding her level. After a while, I was able to add Rorona to my party, and she helped a lot, which made things a bit easier. You will want to use everyone to get their endings though. Atelier Totori has a balancing act of finding ingredients, fulfilling requests and fighting monsters. Early on I was pretty good at it, but as I increased my rank, I would open new locations with monsters that were stronger than my party. I needed to synthesize things to make better armor and weapons and spend precious time fighting enemies at my level so I could adventurer further out. Normally, this is not a problem, but I always feel the time pressure on every action I take (or waste). As I went along, I got much better at balancing out all of the different aspects and had a smoother experience. Now on to the trophies. A large bulk of the trophies are for viewing special events that contain a nice picture and getting the various endings of the game. While getting all the different endings is easiest with multiple playthroughs, it is actually possible with one run. Be prepared to follow an exact list though. There is a new game plus, which keeps your current equipment and your money. It would be nicer to keep more of what you earned, but this is at least nicer than starting over with nothing. With a little planning, you can make subsequent runs much easier and maximize what you keep. If you like JRPGs and have a Vita, I'd definitely recommend picking up Atelier Totori, even over the PS3 version. It looks great and has added content, and no touch screen interaction (other than optionally on the save screen and tapping the back screen for an extra animation) to smudge up the Vita's beautiful big screen. I had over 40 hours of playtime (that seems to be common for my first run through RPGs nowadays), and plan to make at least one more run through it all. Unless you follow a guide letter by letter, you too should get multiple runs through the game and Atelier Totori is well worth the asking price. 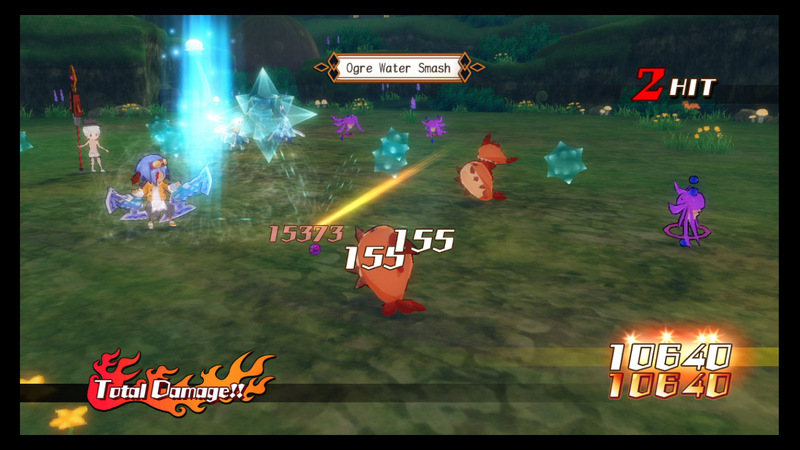 After being available only on disc form, Mugen Souls has made its way to PSN. Made by Compile Heart, it combines some of the best parts of Hyperdimension Neptunia mk2 and the Disgaea series to make a very unique game. The story follows a creature named Chou-Chou who has amnesia and decides to conquer the 7 worlds and make them her own. Joining her is a demon named Altis that is so clumsy at being evil she has been banished to be an angel and Ryuto, the mistreated pilot of the space ship. Yes, I said space ship. How else are you going to get to the other planets? Basically, to make the worlds hers, Chou-Chou plans to make the strongest on each planet, the chosen hero and demon lord, into her loyal minions so the rest of the population follows suit. The story is over the top, to be sure, and has a fair bit of humor in it. It's definitely aimed at adults, since there are lots of breast and pervert jokes (and several hot springs scenes). To make enemies into her peons, Chou-Chou employs a "Moe kill" technique that makes them fall in love with her. And since everyone has different preferences as to what kind of girl they like, Chou-Chou has eight different personalities to cover all the bases. There's Ego (default Chou-Chou), Sadist, Masochist, Graceful, Ditz, Terse, Hyper, and Bipolar...and you thought your significant other could be crazy at times. This system translates into combat, which adds a lot of complexity and is fun to boot. Each personality has different weapon and skill preferences (but anyone can equip any weapon, so you aren't out of luck when you switch). Also, Chou-Chou can initiate a Moe Kill once per turn (and it doesn't take your attack!) by picking three phrases from the random list it provides you. Each monster responds differently to each Moe type (personality), which determines which bar fills up when you choose your phrases. You can either recruit the monster as a peon (which makes it a rabbit-like Shampuru), turn it into items, or piss it off. If angered, the monster's HP is restored and it gets stronger. Moe Kill is a very useful system that you will want to use often. It's complicated, but you don't have to master it to use it effectively. Turning enemies into Shampurus will quickly power up your ship's stats and unlock stronger attacks. Making an enemy an item or killing an enraged one will also supply you with Shampurus, but not as many as making them a peon. As long as you keep using it, you will reap the benefits with very little draw back. I eventually learned that the Moe Kill's radius is determined by the equipped weapon's attack range. Equipping a gun or cannon gives Chou-Chou an incredible radius, which makes it almost too good. If you manage to Moe Kill the giant crystal on the battlefield, which ever effect you maxed out (peon, money or anger) will apply to every enemy left! Combat itself is somewhat reminiscent of Hyperdimension Neptunia mk2. On each battle field, you have a set area that you can run around on to position yourself for attacks and skills. Normal attacks can only target one enemy, but if your movement circle overlaps another party member's whose turn(s) are next, you can initiate a Link Attack. There are very over the top, and you will see them often. Well, unless you make judicious use of the skip button (R2) as I did after seeing all of them a few times. Curiously, the Link Attacks don't always seem as strong as just attacking by yourself. I don't know if it's just my perception of it, though. Thankfully, you get plenty of SP to do skills, and they are very strong, so I usually just do those for damage. A very useful and unique function in battles is Blast Off. If using a skill, you can chose to have that attack push the enemy, causing them to crash into other enemies, crystals and even your characters. They can even be launched into the air! If the giant crystal is broken or Moe Killed, the battle will enter "Fever Mode". Launching an enemy into the balls in the sky will cause them to be bounced around like a pinball, giving you huge amounts of money at the end of the fight. Not only fun, but practical, and so far it's the best way to make money in the game. Also, entering Fever Mode will cause the normal battle music to be replaced with J-Pop. I like that, but I realize it won't be everyone's cup of tea. The character story graphics for Mugen Souls are really nice. The dungeons and ship are unique and have good details, and there's even some really cool enemy designs. Of course, if you have played any of the Hyperdimension Neptunia games, some of the enemies will look really familiar. My son even asked me why "the enemies from Neptunia came over to this game". My only real complaint with the look of the game is the character models during combat and running around the fields. The characters in the game are all different, some are taller, older, um... different in other areas... but the models used in battle and traveling in the field are all the same base. It's the same proportions, just with different hair and clothes. I know this is because you can put clothes on all your characters and having to only make one size is much easier. Still, it would be nice if they were more unique. Speaking of clothes, it would be nice if there was a basic set on a character when you first make them. I didn't purchase any clothes at first, since they were expensive, and was surprised when I made a character (a mage to round out my team) and they were just in underwear. Since I would have felt silly battling with a person in tighty-whities, I sent them to the sub party until I was able to get them something to wear. I'm sure my kids would have been laughing for ages had they seen a person fighting in their underwear. Just like Disgaea, you will want to make plenty of the generic soldiers to fill out your ranks. Not only is it important to have some backup characters for long treks through the Mugen Field (a place where you fight several battles in a row and after a few floors you can buy various upgrades to characters, new jobs, artwork, etc. ), but you can also use them to teach skills to each other and increase stats. There is a "Fuse Peon" function that will transfer skills and increase stats from one of your created characters to another or story character. Both will start over at level 1, but the base character will be stronger when they get back up to the level they were at before fusing. If you are familiar with the rebirth function in the Disgaea games, you'll be right at home here. This system is ridiculously deep, but thankfully it's also easy enough to get results without mapping every character's growth chart in Excel. The game has dual language, and many of the lines are spoken. It is worth noting that there are more spoken lines with the Japanese audio, if you want to hear all the game has to offer. This is most obvious when using the created characters, since they only have spoken lines in Japanese. It's a big jarring, but I didn't use them much anyway. Another example is the ship battles. These have voices in Japanese, but are silent when set to English. It took me over 50 hours to complete my first playthrough of the story. For the first six or so chapters, I made really good progress and was able to work through each world with minimal difficulty. Starting in chapter 7, enemies and especially bosses started to get tougher. Their levels and stats seemed higher than what you would normally get just fighting all the enemies in the area. I had done a few runs through the Mugen Field during the chapters, but had to return to it time and time again to grind out a few levels. It's not particularly time consuming, but it was a momentum killer to be sure. Especially in chapter 9- the last boss of that is over level 100. So, yes, there is a lot of playtime in the game, but some of it will be diving into the Mugen Field repeatedly to level up quickly. Of course, this doesn't even take the post game super bosses (available after getting the "true" ending) into account. New game+ is also in Mugen Souls, which is always awesome. There are two separate endings if you want to go through the game a second time. 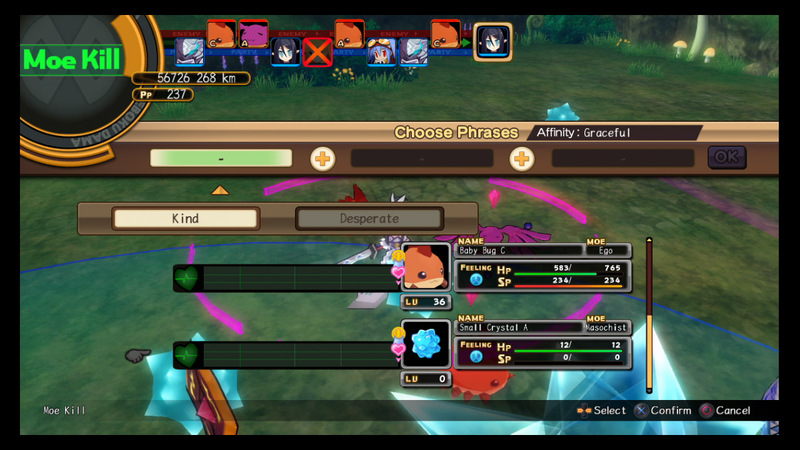 There is actually a healthy chunk of DLC for Mugen Souls. The things that cost money are a few item packs and costumes from other games (Neptunia characters and even Hiro from the Spectral Souls games). However, there are a lot of free items, notably some money, points, and some weapon and armor packs. If at all possible, grab the free stuff. It gives you a good leg up with the free equipment, and the points and unlocked battles can save you some grinding. If you aren't interested in making the game a little easier, at least grab the money and clothes, if only so you can dress your army of peons! I found this to be way too funny. Do you want the platinum trophy for the game? Then be prepared for the long haul. You get some trophies for clearing the chapters of the game and getting the endings. There's also a few for doing various game mechanics, like Fever Mode, Moe Kills and massive damage. Getting a huge peon ball (which requires over a million shampurus) and having Chou-Chou's charm levels at 100% will set you back many, many hours (a couple hundred). So, yeah, if you are after the platinum...bring some snacks. 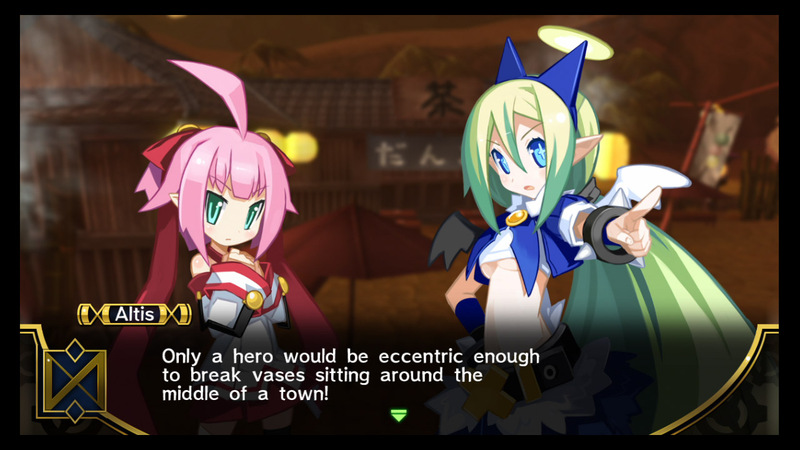 Mugen Souls is a very deep JRPG that has lots to offer. The many systems in the game are introduced to you one at a time, so you can grow accustomed to it before learning more about the game. The ship battles add a nice distraction to normal combat. In essence, they are a more complicated version of rock, paper, scissors, but also really fun and worth a ton of experience. There's a lot of playtime just to complete the story, but chasing the platinum will demand dedication (and lots of hours). If you were a fan of Neptunia's battles and/or Disgaea's crazy characters and story, Mugen Souls is definitely a game you should check out, even if the story can get weird at times. Ah, Nintendo Direct. I'm a fan of these, since to me, it shows that the current E3 is not really the future of the game industry getting out its message and previews of new games. That aside, Nintendo opted to have another Nintendo Direct in lieu of a huge stage conference. They had some really good trailers in it, too! First off, we got some new info on the next set of Pokemon games, Pokemon X and Y. They now have a release date, October 12, which is always good news. In an effort to balance out Dragon type Pokemon, they are adding another type- Fairy. Yeah, I know... Well, dragons did need to get knocked down a peg, since they made ice types harder to get, and the ones from Pokemon Black and White were just terrible and ugly. They showed the first 4 fairy types, one of which is...wait for it...a new Eevee evolution. Who didn't see that one coming? The rest are: Jigglypuff (might be useful now? ...No, I doubt it), Gardevoir (awesome Pokemon, even if I can't spell it's name correctly) and Marrill. I'm not sure how a water balloon is a fairy, but whatever. There's also a mode that allows you to play with your Pokemon like Nintendogs. I don't think this is necessary (or wanted by the older fan base), so hopefully I can ignore it entirely. A few other games were shown: a new Mario or two, Pikmin 3 and some of the two "new" Legend of Zelda games. I don't really like the Mario games, including the new Mario Kart (shocking, I know, considering how much I loved the first Mario Kart), and I still haven't gotten around to trying Pikmin (I have one of the remakes on Wii). As sad as it is, I don't like the Wind Waker art style and I'm not really a fan of the 3D Zelda games, so I'm not really excited about that. The re-imagining/ sequel to A Link to the Past does look really cool, as that is my favorite Legend of Zelda game. A day or so after their Nintendo Direct, they talked more about it. It seems Link now has an ability to make himself a 2 dimensional cave drawing looking thing and travel along walls. I have no clue why in an actual 3D game, the hero has a power to make himself 2D. Almost seems counter-productive. Before I get to the final awesomeness of what all they covered, I want to talk about the new game being made by the team that made Xenoblade. It looks similar, but you can also summon a "doll", or giant mech suit that you can pilot in battles or even while moving around the map. As a robot fan, and fan of the team's other works, Xenoblade and Xenogears (currently my third favorite game of all time), I want to play this game. If I don't have the Wii U by the time that game comes out, I will probably get it. The game is right now just called "X" (which looks a lot like the Xenogears/ Xenoblade "X" in the titles), so hopefully it gets a real name soon. Maybe Xenodoll? Oh, and at least one of the mechs you run around in can transform. I can't wait to roll out, even though the game appears to have multiplayer. As long as I can play the whole game solo, I will be a happy camper! Now to the star of the show...Smash Bros! Being developed by a team at Namco Bandai (whom I affectionately refer to as "Bamco"), there were some trailers released that showed three of the new fighters. First up (in reverse order of excitement) is the nameless Villager from Animal Crossing. Yeah, I don't care either. Next up, the generic Wii Fit trainer girl. She'll likely be a joke character, like Game & Watch, so I don't mind her, even if there were much better choices for a character (the princess from Archaic Sealed Heat? Anyone?) However, all other character reveals shall pale in comparison to the character I was pulling for last game. The one, the only, super fighting robot...Megaman! Yes, the Blue Bomber, in a 3D-ified version of his 8-bit self has finally come to the world of Smash Bros! He's a perfect addition. They showed several of his moves, but I'm still hoping he has a similar mechanic to Kirby, but he copies the move of the last opponent he killed. The only sad part is Nintendo (or Bamco) is picking up Capcom's slack. Since some of Nintendo's games from the show floor were also playable at Best Buy stores, but curiously not in the area near the Nintendo of America headquarters, I'm sure some of these will be at PAX Prime so I can get some first hand impressions. Check back in September! As we did with the Xbox One, let's start with the things that make people think that Sony "won" E3 (I wasn't aware it was a contest): it doesn't need to connect to the internet and Sony won't require DRM. These both are pretty much what the PS3 already does, so it shouldn't be that much of a surprise. While Sony won't require the DRM, they did say that the publisher has the final say on if that is imposed or not. Much like the online passes that people hated, I can see this making people mad later on down the line. I'm not saying that third party companies will have a one use key code like the Xbox One, but you can't rule it out. Also, since the next gen will undoubtedly push digital sales even more, there's a chance that the Xbox One's ability to transfer the ownership of a digital sale might give it an advantage. Of course, third parties might just have the same transfer system for both systems and it will be a moot point in the end. Time will tell on those fronts. The price, however, is a lot more attractive than the Xbox One. It will be $400, a whole hundred less than its competitor. This price doesn't include the camera though. Again, I doubt I will be buying one at launch, as I learned my lesson doing that with the Wii and 3DS. It comes with a 500GB hard drive, but no word yet if it is upgradeable. Given how happy I am with upgrading the PS3 HD, I'm hoping it is. Ideally, I think a 1 terabyte would be the best for me, given the push to digital releases will fill up 500 even faster than last gen. As for the look of the console itself...well, I'm not a fan. It looks too asymmetrical to me. It's a parallelogram and just does't look right to me, since it will take up a bit more space looking like that. Granted it doesn't need to look good to preform, but it couldn't hurt it to look better. Let's move on to the games. As with most presentations, we got a lot of cinematics and not much gameplay. Mad Max, The Order: 1886 and Infamous: Second Son look nice, but I'd like to see gameplay before deciding. The Order has a nice setting, and I'm digging the steam-punk looking weapons, but I'd like to see if it's third or first person and if there's any multiplayer before getting too interested. My friend remarked that he will buy Second Son since it is set in Seattle, which we live very close to. Later there was a video showing the gameplay of Second Son, and it looked pretty fun. I wish they would have shown some of that during their conference. Another extremely pretty game they showed was Dark Sorcerer. It had a funny trailer, but again, I want to see what kind of game it is before caring too much. They did show some in-game footage from Final Fantasy Versus 13, now renamed Final Fantasy 15. Yes, I'm too lazy to use roman numerals. Anyway, it looked too action oriented. Yeah, I might end up checking it out, but I'm not holding out too much hope. After Final Fantasy 10, the series really fell again for me. I kind of enjoyed 13-2 so far, but the rest were not that fun to me (even though I completed 13). Also their second MMORPG, Final Fantasy 14, is coming to consoles at some point. Yay? I might try it if it were a free to play game, but I don't think it is. The races of that game and FF 11 were not appealing at all to me, quickly turning me off. Playstation Plus will continue being a great value by adding PS4 to its family. There will still be the current benefits (yay free games! ), but now will be required to play games online, similar to Xbox Live. I'm fine with this, since Plus was a great purchase for me, even just for the free games. I don't play online games very often, but I understand that it will be a deterrent to some. Let's hope their network improves since it will no longer be free. Just like the Xbox One, I'm hoping some of these will be playable at PAX Prime. At the very least, I'd like to use the controller to see how it feels compared to the PS3 one. E3 is happening this week, and sadly I won't be there. I didn't really expect to be, but I figured I would give my impressions of what I saw from the streams and whatnot. If you've read my reviews or heard any of the XGR podcasts, you may know that my opinions are a bit different from the 'norm'. Don't get offended if I don't agree with other people or if I'm not excited about the 16th Call of Duty game. Anyway, first up: Microsoft. Let's just start with everybody's favorite hot button issue with the Xbox One: the always on and the DRM stuff (I know this more from the reveal, but it's important so I'll just talk about it here). Honestly, the always on isn't that big of a thing for me personally. I'm OCD about having dates on my achievements (I realize this isn't actual OCD), so I only play my 360 when it's connected to the internet. The only reason my PS3 isn't always connected is because it bumps me offline a lot. It's not my ISP that does it, just the system. I don't really play the PS3 online, so maybe that might be why. Regardless, I try to keep it connected anyway, so that's not a deal killer to me. I have had times when my internet is crapping out and I can't connect for an hour or a day or so, and completely understand why some people have issues with that. I do think a lot of people are overreacting, though. The DRM (digital rights management) sounds just like PC games' DRM (like Steam). I'm not really happy with it, but again, I feel most people are overreacting. I've honestly seen people comment that they don't like having to be online to play and not being able to resell, so they will just play PC games...*shakes head*. Anyway, since the game disc just installs on the system, I understand why they have the check-in every 24 hours. Is it the best solution? Not to me. I try to buy new games anyway, since I want to support the industry of my main hobby, but it doesn't seem like the best move on Microsoft's part. I feel that they check-in is to combat people modding their systems, since those people won't connect to Xbox Live so they don't get the system/ account banned. The silver lining is that you can designate people as "family" and they can also play the games you paid for. I'll need this as my children get older and begin to play more games. That was my biggest concern with the DRM. The price for the Xbox One is $500. High? Yes. Fair? Yes. For a new system that includes the Kinect, five hundred seems like it's an appropriate price. I believe the 360 was a similar price at launch, so it's not unexpected. It's still too expensive for my budget and I won't likely get one unless there is a sale or a price drop. If there's a game that I really want, I'll get that cheap even if I don't have the system, as I've done with other games. Microsoft is also doing away with Microsoft Points, or MSP for short. I know people have wanted that for awhile, but I didn't. The conversion isn't too hard (points # is 20% less than the dollar value), and you could find good deals on the point cards. It's much harder to find deals on the PSN and Wii/3DS cards, which use real currency. Everyone knew they would change it one day, but I don't think it's a good thing. Now that all of that is out of the way, let's go to what matters the most on a games console: the games. Minecraft will be ported over. One of my fellow Xpound members remarked that it didn't look different from the 360 version, and we tried to explain that is what the game always looks like and it shouldn't look different. Anyway, I'm looking forward to that since the massive memory upgrade will benefit Minecraft. I doubt it, but it would be nice if they didn't charge owners of the 360 edition to get the Xbox One edition. Either way, I'm sure I have to get that game for my son alone. Unlike the reveal event, they actually showed some games. Most of them were just CG trailers that contained little to no gameplay (this is a theme from every company every year at E3 it seems). Halo and Forza were shown, but I have little interest in those franchises. They showed some of the next Battlefield, which will make a few of my friends very happy. A trailer for World of Tanks for the 360 was shown...again, not that interesting to me. The trailer for Titanfall had me somewhat interested, since riding around in mecha is definitely something I like. It will probably be just another competitive FPS game that I won't play, but I'll at least look into it closer to launch. Quantum Break at least showed something this time, unlike the lackluster trailer at the reveal. I still don't know much about the game, and wish that they would show how it plays instead of "look how pretty it is", but we'll have to wait and see. Sunset Overdrive looked interesting (Dead Rising meets Borderlands? ), but again, I wanted to see actual gameplay. Now on to a few games that I have some interest in. Crimson Dragon looked kind of fun. I played a little bit of Panzer Dragoon Orta, which this is the spiritual successor to I believe. That game was ok, so I will probably at least try Crimson Dragon. Capcom's Dead Rising 3 is exclusive to the Xbox One. That surprised me. Again, they switch protagonists (I still prefer Frank West, no matter how many times they try to ditch him), but the rest of the game looks fun. Honestly, the demo of State of Decay seems more like what I want the Dead Rising games to play like, so maybe I'll stick with that once it goes on sale. Killer Instinct?! Wow, that I did not see coming. So much nostalgia thinking about watching my friend play that game, with his team of all TJ Combos. Good times. Well, this game looks nice and has flashy effects, but almost looks to fast. The Jago redesign isn't the best, but I really like Glacius' look and I'm looking forward to seeing the rest of the cast. It is also coming out as a free to play game, where only Jago is unlocked. You will have to buy any other characters you want to use. You can apparently fight any of the other characters, so there will still be some fun to be had in the free version. It's a pretty interesting idea for a fighting game, so we will see how that (and the new Tekken game) do in sales. Another game at the conference was Ryse: Son of Rome. Besides the obvious inspiration from God of War, I looks like and is presented like Gears of War. So, I guess it's double "GoW". It actually looked pretty interesting, so I look forward to trying it at some point. The quick timer events look shorter than the God of War ones, which is a plus. There were also ones where the hero would kill two targets in the same QTE. That looked pretty cool and gives it at least something different from Kratos' adventures. While it looks interesting, I don't think it will be a system seller. Project Spark was a game that showed actual gameplay. It looks like a third person action adventure version of Little Big Planet, and it looked fun. You could design a world as quickly and easily as you design a track in Modnation Racers, but could set enemy and pet/helper AI like the LBP games. It was one of the few things showed that I was really interested in trying out as soon as I can. Too bad I don't have a tablet (or smart phone) that can likely integrate with it. In an effort to compete with Playstation Plus, Microsoft will give out 1 or 2 free games to download for XBox Live Gold members. In theory it's pretty cool, since free games are always nice. The first game is Fable III, which isn't that good of a game. The other two games mentioned are Halo 3 and Assassin's Creed 2. Not bad, but they are pretty old. I also own all three so there's no need for me to download them. They are only giving away games for the next 5-6 months, so it's a pretty short time frame. Available immediately, they also announced a new Xbox 360 design that looks similar to the Xbox One. I guess it looks fine, but I already have a 360 and the only other design I want is the Star Wars R2D2 bundle. I'm hoping that the system and some of the games shown will be playable at PAX Prime so I get a chance to check them out first hand. If they are, you know where I'll post my updated impressions! 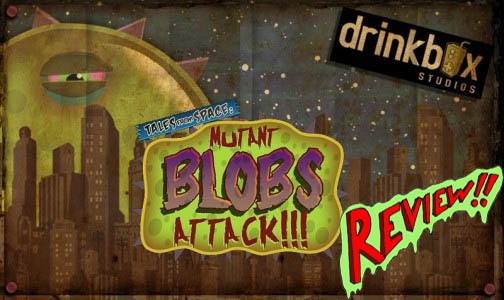 Tales from Space: Mutant Blobs Attack has players play the part of a mutant blob who escapes from a research facility and proceeds to cause mayhem to the world that experimented on him. You will have to jump around, avoid dying and eat up lots of items to grow and exact your revenge. The graphics look like flash animations. The humans depicted look strange, but it's intentional and works with the nature of the game. The blob itself looks awesome- it is very fluid and contorts to fit in different spaces, which makes it seem more realistic. Well, realistic for a mutant blob. The music is fine but forgettable. However, the ending theme for the credits is funny. It's a nice way to end the game. At its heart, Tales from Space: Mutant Blobs Attack is a platformer. You have to jump and navigate the stages and hazards from one end to the other in order to advance. Thankfully, there are several things in the game to differentiate it from its competition. The blob can 'eat' various things lying around, and eating enough will make him bigger and allow him to eat/absorb larger things. So, there's a little Katamari thrown in to fit the theme. Your blob also gets a magnetic ability so you can attract or repel yourself from metal surfaces. This leads to some interesting platforming and puzzle solving, and was a great way to add something unique to the game. There's several sections where you have to move various elements by using the touchscreen. There are platforms you can move and bars you can rotate to launch items or the blob itself. These can be fun, however, sometimes the touchscreen isn't as accurate as I'd like. Trying to jump around while holding the system with one hand or having a giant finger in the way of your screen can be annoying and frustrating. There are a total of 24 levels spread over 6 areas. Each level lasts anywhere from about 5 to 20 minutes. The levels are not too hard, even though there are several frustrating parts. Checkpoints are fairly generous, which alleviates much of that annoyance. In each area except the final one, there are motion levels where you have to tilt the Vita around to move the blob. At first these were really annoying, so I skipped them (you can opt not to do these). I later realized that I was tilting it incorrectly. Hold the Vita flat out in front of you, as if it were a table, and tilt it each direction that way. It made the levels pretty easy. Tales from Space: Mutant Blob Attacks has 14 trophies, most of which are from story progression or doing a small task during a level. Overall, most of them aren't very hard or take long to get. The longest ones are getting all the friends in all the levels and getting the gold medal score on every level. This will require you to play several levels over again, since getting the gold medal score can require almost all of the scoring opportunities in a given level. The game is pretty short and could reasonably be completed in an afternoon. It's a fun pick up and play game to spend some time with, but there isn't really any reason to replay it. If you are after trophies or a higher spot on a leaderboard, you could get a little more playtime out of it. It costs $7.99, so I was thankful I got it for free from Playstation Plus when it was offered. Eight bucks for an afternoon or two of entertainment is cheaper than a movie, but I'd wait for a sale if you are interested in getting this fun little game. The long awaited demo for Project X Zone dropped onto the Nintendo E-Shop the other day. I'm looking forward to the main game, so I had to give the demo a whirl. The first thing I noticed (and other people did too) was that you have a max of 5 uses for the demo. Wow. I thought the 30 for a few other demos was pushing it. I don't play a demo more than a few times, so I don't understand why they even limit it in the first place. Five seems way too small, even if I don't play it more than twice. That might sound silly, but so is limited the number of times someone can try the demo they downloaded. I love the graphics in the game. At first I thought the cut in scenes (when using a super, or cross assault) would be 3D themselves, but they are just on the front plane. They still look great. The 3D is pretty good too, and I can actually have it on while playing and it doesn't make it harder to play. Hearing the songs I recognized from the respective IPs was simply cool (yay Sakura Wars! ), so the music was spot on, even if it can be weird that it changes every time your character's turn comes up. The voices are Japanese, which I already expected since they said they weren't going to dub the game. While I would prefer it dubbed, I'm willing to do without since it means the game is coming out here. If you have played Namco X Capcom, you will be right at home with combat in Project X Zone. Basically, the field map is a grid-based strategy RPG, or SRPG. When your turn comes up, you can move anywhere in a set movement grid. You can attack an enemy within a few panels of your character, and if next to friendly units, they can jump into your battle for an attack. You can also use items and skills before you attack an enemy. I like that you can use multiple, so you can heal multiple units before starting a fight, as only selecting end turn or attacking will end your turn. Combat is a very pretty combo-fest. You control a team of two characters that can do multiple attacks, and each one has a lengthy animation that hits multiple times. The idea is to time your various combos and juggle the enemy (the Tekken characters should have an advantage there, hahaha.) without letting them hit the ground. This is essential on the armored or strong enemies, as you have to break their guard to do damage. If you do all the different combo attacks during your turn, you are rewarded with another attack. It didn't take long to figure out when to start the various attacks to maximize the juggle time and damage. Adding more characters did make it much more difficult. A third character is equipped to each group, save the Sakura Wars team (in the demo), which can be summoned for more damage. It took a time or two to figure out when to best summon them for max damage. As mentioned earlier, another group can also jump in your battle for crazy amounts of damage and attacks flying around the screen. It looks awesome and I really like it, but it makes it harder to time the attacks for the best damage. You will want every point of damage you can get for the boss in the demo. She's tough, but you can easily overcome her if you rush her with all your characters when she appears. I wanted to clear out all the enemies, which cost me 2 of my units. I should have taken her more seriously. Just for reference, the characters you are given are: Soma and Alisa from Gods Eater Burst, Ryu and Ken from Street Fighter, Kite and Blackrose from .Hack, Riela and Kurt from Valkyria Chronicles (2 or 3, I have only played the first for a bit), Gemini and Erica from Sakura Wars (the latest one on the Wii and PS2), and later Sakura and Oogami from the old school Sakura Wars. The 'solo' characters (the third that you can equip to a group) are Imca from Valkyria Chronicles, Devilot from Cyberbots, Lindow from Gods Eater Burst, and Ulala from Space Channel 5. The enemies I recognized were from Space Channel 5 and Gods Eater Burst. Geez, that's a lot of name dropping. There's only 1 stage (set in the Sakura Wars universe) which can be completed in 30 mins or so. It's just enough to give you a taste of the combat, which was what I really wanted. I had fun playing the demo of Project X Zone, so I'm still looking forward to the full release later this month. I almost wish it were on a console so others could watch the flashy battles on the big screen. Europe is getting a second demo (their first is the same as ours), and it would be nice if that one hit our E-Shop before the game is released too.